Tarra and Bella are best friends. 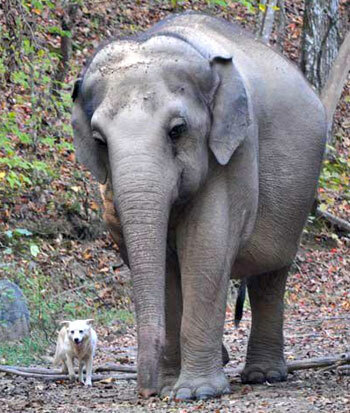 Tarra is a 8,700 pound Asian elephant, and Bella is a stray dog that was adopted in 2003 by the Elephant Sanctuary in Hohenwald, Tennessee, where they both live. Elephants tend to search for best friends, usually other elephants, with whom they spend most of their time with. However, this interspecies duo is inseparable. They take walks together, eat, sleep, play, and despite their size differences, Bella lets Tarra pet her tummy with the bottom of her gigantic foot. In 2010, Bella suffered a spinal cord injury that left her to spend three long weeks of lying motionless in the sanctuary's office, unable to move her legs or wag her tail. Bella not only received care from the workers, but also the support of her best friend Tarra, who stood outside the office the entire time, waiting. One day, Scott Blais, co-founder of the sanctuary, decided to carry Bella and bring her to meet Tarra. The two animals were ecstatic to see each other and these meetings were repeated until Bella could walk on her own. Tarra and Bella's friendship took a sad toll when Bella was allegedly attacked by coyotes and passed away in October 2011. The Sanctuary's workers believe Tarra found her best friend's body after she was attacked in the woods and carried her home. This loving gesture allowed Tarra to come to terms with Bella's death, a very important part of the grieving process for elephants. Tarra reached out to her sisters for support during that difficult time to bring her food and keep her company. 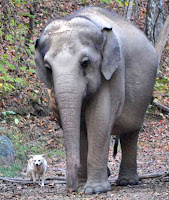 Tarra and Bella's interspecies, yet devoted friendship has inspired and warmed the hearts of many, specially at the Sanctuary, whose caregivers have created a tribute for Bella. The Bella Foundation website has also been set up to collect donations to support the ongoing care of their elephants as well as stray dogs, like Bella, by giving part of the proceeds to local humane associations that help them look for a permanent home.